These keto green chile chicken enchiladas are creamy, cheesy, and so flavorful! They are made with made with zucchini instead of tortillas, so these keto enchiladas are low-carb and gluten-free. 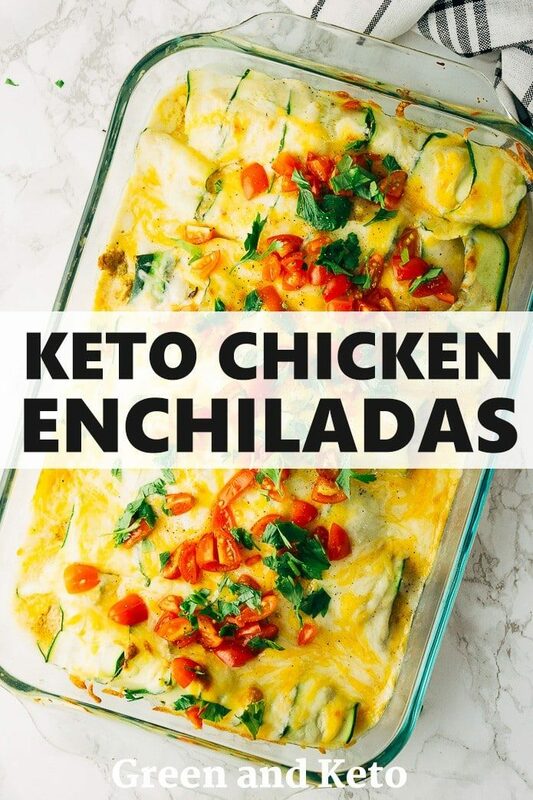 I love this recipe for keto enchiladas. But what I love even more? My whole family enjoyed them! Even my picky 3-year old, who basically survives on strawberries and toast. 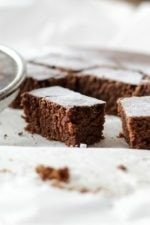 If he likes them, you know this recipe is a winner! Swapping the traditional tortillas for zucchini noodles is a great way to enjoy your favorite enchilada recipe and stay on track with a low-carb diet. If you like green chiles, I can guarantee you will be making these enchiladas all the time. The keto enchilada recipe starts off with the most delicious chicken filling! This is a great recipe for using up leftover chicken. The day before I made this recipe, we had roasted chicken thighs for dinner. The next day, I shredded the leftover chicken and used it in this keto chicken enchilada recipe. Cooked, shredded chicken. I used the meat from 4 large chicken thighs. You could also use leftover chicken breasts or even a rotisserie chicken that you pick up from the grocery. Spices, like cumin, chili powder, salt, and pepper. Cheese! There is cream cheese in the filling, and shredded cheese on top. I used a blend of Monterey Jack and Cheddar cheeses. Zucchini, sliced thin with a mandolin or a vegetable peeler. Green chiles and green chile sauce. To make green chile chicken enchiladas, we first make the chicken filling. If you have leftover cooked chicken, you’re ahead of the game. Otherwise, you can quickly bake some chicken thighs, and shred them. Mix the cooked chicken with softened cream cheese, spices, and green chiles. Then, prep the zucchini. Using a mandolin or a sharp vegetable peeler, slice the zucchini into thin strips. When you are ready to assemble the enchiladas, lay out 5-6 zucchini slices, overlapping them slightly. Add a small scoop — about 1/2 cup of the chicken mixture — on the middle of the slices and spread it out. Carefully, roll the zucchini slices up around the chicken — just like you would with a tortilla. Transfer the zucchini enchilada to the baking dish, and repeat with the remaining zucchini slices and chicken mixture. Once you’ve rolled up the enchiladas, top with the green chile sauce and lots of cheese! Then, bake until the cheese is bubbly and lightly browned. Top with chopped tomatoes, salsa, and fresh cilantro. Feel like chicken for dinner? Be sure to check out our other chicken recipes like Sheet Pan Chicken Fajitas, Thai Chicken Salad, or Creamy Mushroom Chicken Skillet with Parmesan and Bacon. Bonus points: these keto enchiladas freeze well! I like to make a double batch and freeze one for a rainy day. It’s so easy to stay on track when I know I have an easy keto dinner stashed in the freezer. Reheat individual servings in the microwave, or reheat the entire pan in the oven. 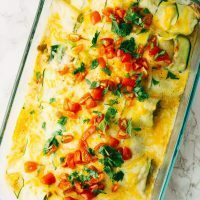 If you are looking for an easier way to enjoy Keto enchiladas — or just don’t have the time to make zucchini roll ups — you could always make this recipe “casserole style” instead. 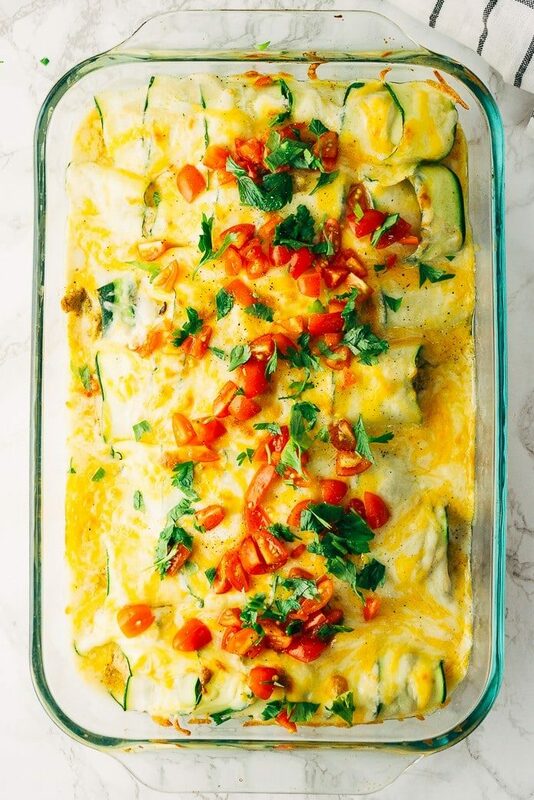 To make Keto enchilada casserole, you can layer the zucchini slices, the chicken filling, and the green chile sour cream sauce like you would with a lasagna. First, spread a half cup of the green chile sour cream sauce in the bottom of the 9 x 13 dish. Add a layer of zucchini slices. Then, add a thin layer of the chicken filling and a portion of the green chile sour cream sauce. Repeat these layers with the remaining ingredients. Top with shredded cheese and bake as directed in the original recipe. Keto chicken enchilada casserole has all the flavors of the original recipe with an easier, quicker method. When I need dinner on the table in a hurry, this is the way I make it. The keto enchiladas are creamy, cheesy, and packed with green chile flavor. In a large mixing bowl, add softened cream cheese, shredded chicken, diced green chiles, cumin, chili powder, salt and pepper. Stir together. In a small mixing bowl, stir together sour cream and green chile sauce. Prepare zucchini: Using a vegetable peeler or a mandolin, slice the zucchini into thin strips. Lightly grease a 9x 13 pan. Place a large spoonful of the green chile sour cream sauce into the bottom the pan. 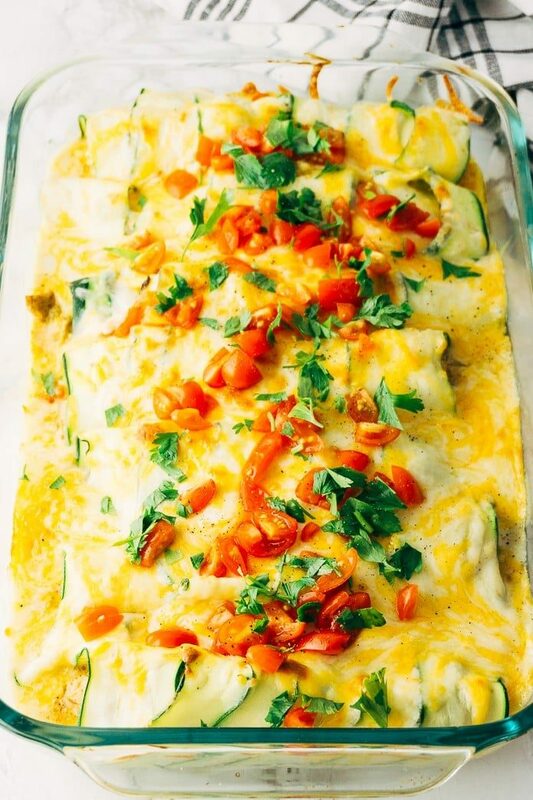 Assemble enchiladas: On a cutting board, lay out 5-6 zucchini slices, overlapping slightly. Add a small scoop (about 1/2 cup) of the chicken mixture. 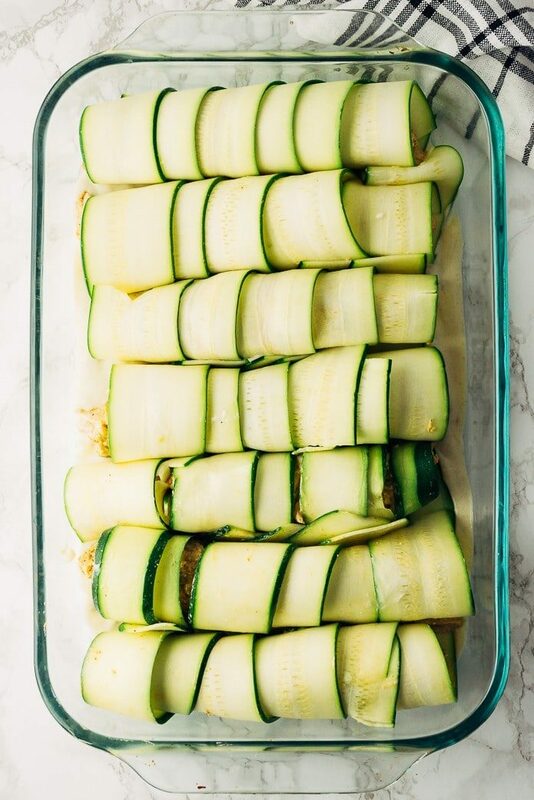 Carefully roll the zucchini up around the chicken, and transfer to the baking dish. Repeat with the remaining zucchini slices and chicken mixture. Pour the remainder of the green chile sour cream sauce over the top of the assembled enchiladas. Sprinkle the shredded cheese over the enchiladas. Bake in a 375 degree oven for about 30 minutes, until the cheese is bubbly and lightly browned. Serve with chopped tomatoes and fresh cilantro. Also, try the casserole variation described in the post above! Sarah, this recipe sounds great. I am confused about the 1 1/4 cup of green chili sauce, how do I make this? Anxious to make this Keto version. But I was also able to find a gluten-free canned version at my grocery store, if you don’t want to make your own. The carbs may be a bit higher in the canned version than in a homemade version. I like your website design and your content. I am a food lover and enjoy baking on the weekend when time allows me to cook.